A new report has determined that incorporating ecologically-restorative design into the redevelopment of the highly-degraded riparian areas of the Chicago River—thus creating a revitalized “blue/green corridor”—would generate an additional economic return on investment (ROI) of $1.77 for every $1 spent. The report was issued on March 18, 2019 by the University of Wisconsin-Whitewater’s Fiscal and Economic Research Center. 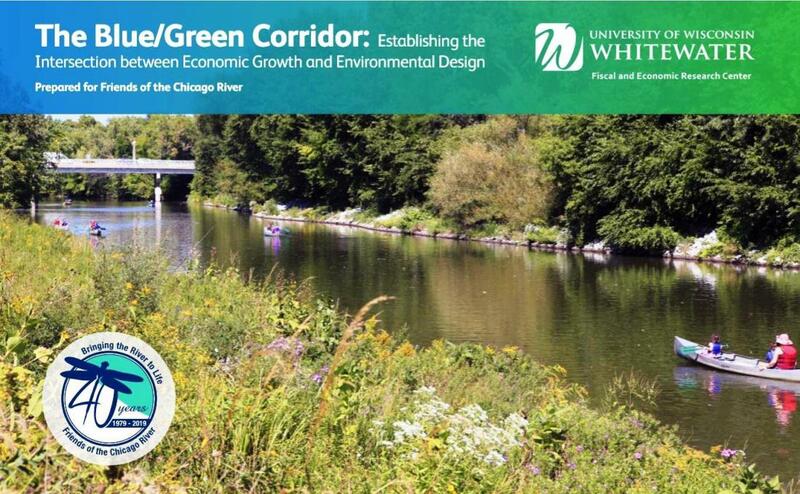 Entitled The Blue/Green Corridor: Establishing the Intersection Between Economic Growth and Environmental Design, the study found that a people, wildlife, and environment-friendly approach to riverfront development would create an additional $192 million in total economic benefits annually over a 15-year timespan. According to the report—which was commissioned by Friends of the Chicago River and released March 14, 2019—a blue/green corridor also would support 1,614 jobs annually as well as improve water quality, biodiversity, recreational opportunities, and public health. Similarly such an approach would help mitigate flooding, air and water pollution, and the urban heat island effect. “In the face of climate change and pressure from urban development, it is essential that a blue/green corridor is established along the Chicago River system,” said Friends’ Executive Director Margaret Frisbie. “We have an opportunity right now to protect and connect the riverfront to provide quality habitat for wildlife and access for people all along the river’s 156 miles. Generations to come will have to live with the impact of decisions made today and we don’t want them to look back and regret it if we miss our chance,” she added. Friends of the Chicago River also unveiled their new Public Land Natural Area Assessment Web Mapping Application that examined 147,158 acres of property within a half mile of the waterway on either bank. About 33 percent are public parcels, more than 37,000 acres are open space, and 400 miles are natural shoreline presenting an enormous opportunity to create and connect healthy and accessible landscapes. In the blue/green corridor study, University of Wisconsin-Whitewater researchers examined the assessed valuations of more than 123,000 properties along the Chicago River system in Cook County and applied a formula based on previous studies that looked at how using natural green infrastructure affected home values. These types of environmental efforts lead to an increase in residential property values of around five percent over 15 years, the Blue/Green Corridor report concludes. Such blue/green corridor approaches have shown to have great economic value in other cities such as Houston, San Antonio, Washington, DC and others. Nature restoration success stories include an escalation of fish species in Cleveland’s Cuyahoga River and a thriving wildlife of turtles, muskrats and great blue herons along Pittsburgh’s riverfront. 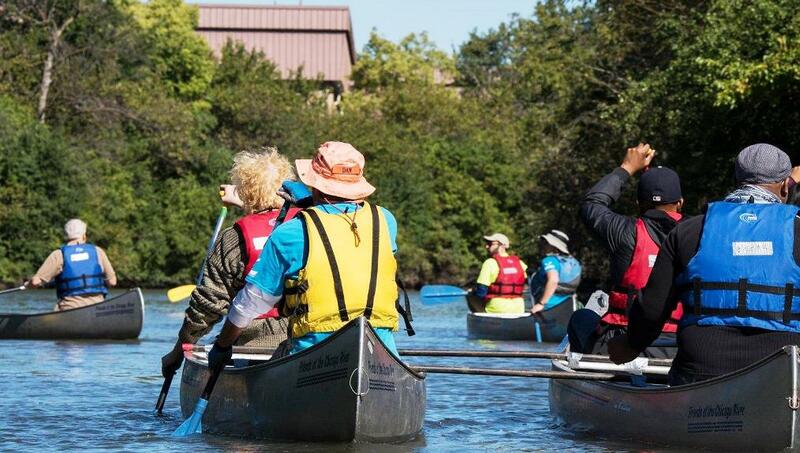 Photo shows a paddle event in the Chicago River in Fall 2018. Credit: Metropolitan Water Reclamation District of Greater Chicago. See the Public Land Natural Area Assessment (PDF). See Friends of the Chicago River website.